Warner Bros.' Dunkirk is now available on Blu-ray. 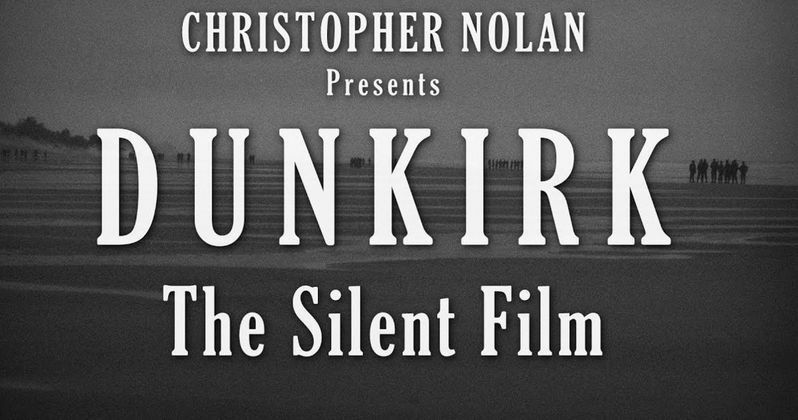 One fan has taken it upon himself to highlight the mostly dialogue-free movie by making a silent film version of the Christopher Nolan epic. The results really show off just how strong Nolan's three-part storytelling is in the movie. Although Dunkirk barely has any dialogue, the 8-minute fan-made video is really well done and even heightens the drama in some of the scenes. Some of the comments on Reddit where the video originated from even claim to like the short film better than the one Christopher Nolan put into theaters. YouTube channel Like Stories of Old decided to make an 8-minute short film of Dunkirk to highlight the talents of Christopher Nolan's visual storytelling. The main bits of the movie are shown, albeit in condensed form, focusing on the land, air, and sea aspects of the battles. The channel focused on Nolan's influences while working on Dunkirk to inject them into the movie in a way that was different from Nolan showing a more nuanced restraint when referencing said influences. The 8-minute short film is incredibly well done, but it's certainly not better than what Christopher Nolan originally did. It's interesting to see a movie that Christopher Nolan went to great lengths to shoot on actual 70mm film converted into a black and white YouTube short. The 70mm film is said to give a crisper picture with more warmth than digital, some even compare it to painting a picture, which is obviously thrown out the window when you're watching a YouTube video on your phone, or even on your computer screen. However, the technical effects are not of any concern to the guys who re-edited it. The short was simply made as a fun project to highlight the visual storytelling talents of Christopher Nolan. Dunkirk is rounding out the year in many critics' top ten movies of 2017 lists, and finds itself in the same company of another movie that received the black and white noir treatment. Logan was officially released into theaters in black and white, but one shouldn't hold their breath for Christopher Nolan to do the same thing with Dunkirk. Actually, this 8-minute short film is as close as anyone will ever see for a Dunkirk noir version. So, if that's your thing, check it out before it gets taken down by the powers that be. Dunkirk repeats the often-told tale of how the British turned an intense defeat in the early days of World War II into an inspiring moment of national unity. But rather than just laying out the details of what happened, Christopher Nolan weaves between three different stories, the aforementioned land, air, and sea. One is set on a civilian boat racing to evacuate the troops, one is following a pilot running low on gas, and one is tracking the desperation of men pinned down on a beach and finds the visual and thematic symmetries between them, even though they're taking place across slightly different timelines. If watching an 8-minute, condensed, black and white version of that sounds appealing, check out the video below, courtesy of Like Stories of Old's YouTube channel. Can Dark Tower Conquer the Box Office, or Will It Be a Big Bomb?